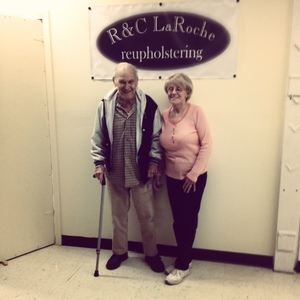 We are often asked “Where do you get fabric, supplies, products, inspiration?” or “Do you know a good upholsterer, restorer, seamstress?” Yes, we do! In our business, we rely on a lot of resources and we are happy to share. 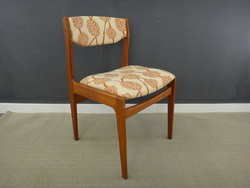 For mid century fabrics we love modern-fabrics.com. Based in Charlotte, NC, Modern Fabrics sells designer fabric remnants including, Knoll, Sina Pearson, Kravet, at highly discounted prices. It is important to order samples as colors on the internet are not true! You can order four free samples at a time. Fabrics are in limited quantities, however, so don’t delay in ordering. We also order wonderful fabrics directly from Knoll and Sina Pearson. On occasion, Fabric Place Basement in Natick has designer remnants. They have a great selection of cotton velvets at very low prices. They also carry upholstery supplies, including foam in various thicknesses. In our studio, when it comes to upholstery, we generally stick to chair seats and backs., benches and ottomans. We buy our upholstery supplies including all sizes of foam--both regular and soy,--cotton batting, cambric, muslin etc. from Saad Upholstery in Salem MA. Although Saad doesn't have a website, he can be reached at 978-774-7711. For almost all our paint needs, we go right across the street to Phillips Fine Paint and Decorating at 95 Commonweawlth Ave in West Concord. Phillips carries C-2 paints, Benjamin Moore, California and Fine Paints of Europe. They also carry a full array of re-finishing products including the environmentally sound Vermont Naturals sealer that we have come to rely on. 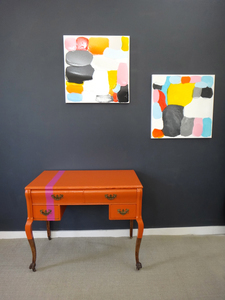 ), who generously lends us her work to enliven our space and complement our furniture pieces. As for inspiration, it comes from many sources, but we do spend a lot of time (maybe too much) on design blogs. Some of our favorites are Design Milk, Design Sponge, Apartment Therapy, Freshome, Stile Files, Remodelista, Desire to Inspire, . . .